FRANKENMUTH, MI – Dairy farmers in Michigan and across the nation need federal lawmakers to revise the safety net created in the 2014 Farm Bill to provide them adequate risk management protection, according to a dairy farmer from eastern Michigan who testified in Frankenmuth on Saturday at a Senate hearing. 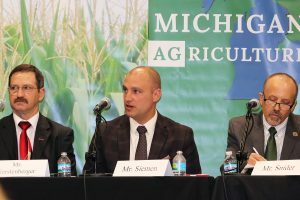 Siemen is a fourth‐generation family farmer and owner of Prime Land Farm in Harbor Beach, in Michigan’s Thumb region. He testified on behalf of his cooperative, Michigan Milk Producers Association, as well as the National Milk Producers Federation, of which MMPA is a member. His full testimony can be found here.